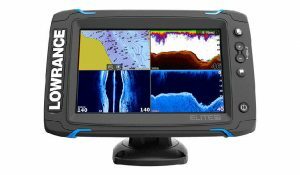 The Elite Ti Series is no doubt the most popular series ever built by Lowrance and the 7-Ti series is one of the most sold and outstanding Fishfinders for anglers. The touchscreen unit comes with all the advanced features you’d expect from a larger device. 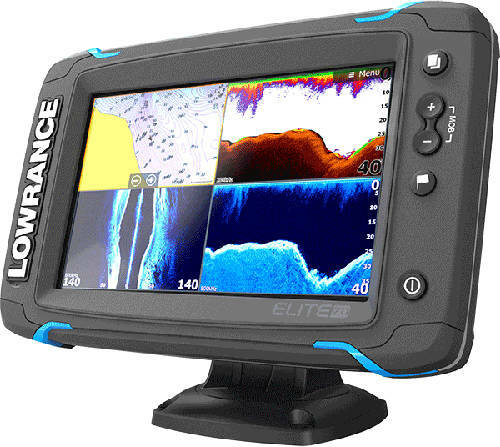 For anglers who are looking for a Fishfinder that will give them everything in one package, the Lowrance Elite Ti series might be what you are looking for. The Fishfinder provides a fluid and smooth performance compared to other Fishfinders. Boosting high-frequency Chirp, and a vibrant high screen resolution, this unit outperforms the regular 200 kilohertz you get from other devices. The Fishfinder is packed with powerful high-end features like a rapidly upgrading 10 Hertz internal GPS antenna, Chirp Sonar, down scan imaging and Structure Scan HD. While the Elite Ti series comes in different versions, the Elite-7 Ti version, which is our major focus, comes at a top-dollar price. Check its price at Amazon here. Of course, this price tag isn’t cheap, but once you factor in the Elite-7’s easy to use interface and top-notch performance, you’d definitely agree that this unit is worth every damn penny. The Elite-7 Ti is a 7-inch touchscreen display that provides some key buttons along the sides. Just like other high-end Fishfinders, the Elite-Ti offers a waypoint button and a power key button. The device also houses a micro SD card slot that is fully sealed and waterproofed. Other than that, you will also notice that the unit is mounted in a GRB five-quick release bracket which allows you to pop and pull the device off. Apart from being able to tilt and swivel fully, it also features a power connector, an NMEA 2000 port, and new pin black sonar connector. The NMEA 2000 port gives you the accessibility to a network for basic waypoint sharing. All the advanced features of a high-end Fishfinder are also embedded in this unit. The only notable thing missing is the noise rejection mode, which is available in the HDS model. The very first thing you will notice about this device is that the Elite-7 Ti is very quick to respond to commands. Zooming in and out the unit is fast and doesn’t show any lag. Just like other high-end devices, the Elite Ti can also do side scan and down scan. Using the down scan imaging gives you a photo-like view to see what is directly underneath your boat and to identify fish targets and bottom structures. The Elite did an excellent job by allowing you to create and customize maps through the online Insight Genesis Service, which can cover quite a few lakes. The Elite-7 did not also forget to include a trackback feature which allows you to scroll back via the sonar history to review fish targets, structures, and mark a particular location using the waypoint. When it comes to the quality of the screen, the Lowrance Elite 7 Ti beats the competition hands down. The unit has a very nice 7-inch high screen resolution and LED-backlit touchscreen that offers you smooth access to all features. However, the screen size seems to be a major distractor, especially if you decide to put it in split mode. The high-performance Chirp Sonar of the Lowrance Elite Ti Series provides a clutter-free display plus enhanced targets. You can 100% tell if a fish is sitting on the bait. It has all the frequency options depending on the transducer selection. You can go from high chirp, medium Chirp or low chirp. The high Chirp mode is ideal for freshwater and provides greater detail for tracking smaller objects. The medium Chirp delivers a wider scan area so you can scan larger areas more quickly. While fish arches are larger in the medium mode, they do lack the details to identify smaller objects. The low chirp offers the greatest Chirp performance while marking fish targets throughout the water column. Do keep in mind that you will have to turn off the Side scan if you want to work with the Chirp sonar. Setting up this unit using the Sonar is a breeze. On your sonar screen, you will have to go to your Menu, then the setting and finally to the sonar. You’ll have the option to select the shallow water mode, which is better for anything less than 60 feet of water depth. But if you are going deeper than 100 feet, then you have to choose the freshwater mode. With the Elite-7, you don’t need to have two transducers on the boat because you can use the one transducer. One thing you have to remember is that if you want to do StructureScan HD on this unit, you have to buy the total scan transducer. Since the Elite 7 has down imaging, it does require a transducer that uses down imaging. Another remarkable thing about this device is that it is all Wi-Fi enabled. The Bluetooth and wireless connectivity do not only allow you to download software updates, but also allows you to download Insight Genesis custom maps for immediate use. So, if you use an Android or Apple system, you can download the app of this unit, and mirror the screen on your phone, which will give you access to control the screen from your tab. No doubt, the Lowrance is a great Fishfinder that delivers all the cool features, making your fishing experience a lot more fun. When comparing this unit with the Humminbird series, in our opinion, the Humminbird shows more information like contour and the difference between brass and rocks. One unique thing about the Humminbird is that you don’t use a trolling foot pedal to move it forward and backward to get an image. Also, while the Elite Ti series seems to provide a user-friendly fairly accurate GPS antenna, the Humminbird series tends to provide more GPS accuracy compared to the Elite. During our test, we discovered that we could easily navigate to a particular marked spot, using the Humminbird series. There’s no doubt about it: the Elite Ti series is a top of the line fishfinder with loads of premium functionality and capabilities. The additions of advanced features such as side and down scan imaging, high-frequency Chirp sonar, and a lot more, make the Elite Ti series one of the best Fishfinders for anglers. That’s why we have made it a part of our top sounders list. Although everything about this unit seems great, the Elite 7 stumbles due to the smaller screen size and its inaccurate Insight Pro Map/GPS. The Elite-7 Ti does, however, redeem itself with its crystal clear display, smooth performance and high-end Chirp Sonar technology to give you the best fishing experience. Undoubtedly, this is still one of the best Fishfinders out there.